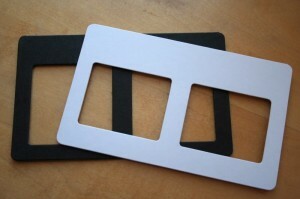 The mounts are available in differing weights and in black or white cardboard. The aperture choices provide cropping and composition choices as well as supporting those users of 645 cameras. Commercial viewers (like the King Inn and the Saturn) and custom viewers were designed around this mount dimension. None of these viewers are still manufactured, but the 80×132 format is alive and well. At the 2004 NSA convention in Portland, I first saw the 3D World products. They had their coin-operated sequential-viewer, a prototype of what would become the TL120-1 camera, a steal-the-light viewer, sample slides, and boxes of plastic slide mounts. The slide mounts were very expensive but I bought a couple of them to see what they were like. The original 3D World mounts were thicker and larger than the cardboard mounts to which I was accustomed. They were designed for use in the 3D World viewers and could not be used in the King In or Saturn viewer. These first edition mounts were about 4mm thick and had 54mm square apertures spaced at 65mm. This effectively put the stereo window of every image at infinity. Everything in every image was forced in front of the window and window violations were unavoidable. The mount halves were held together very poorly by sets of troughs and grooves. It was quite easy to say, “These mounts aren’t worth plastic it takes to make them nor the postage required to obtain them.” Should you come across any of them, please destroy them. Sam Smith worked with 3D World to correct some of the deficiencies in their mounts and sometime in 2006 they released a second edition. These had the same same outer dimensions (80x140mm), but were only 2.8mm thick and had smaller apertures (52mm) spaced at 62mm. These new mounts were held together with six 1.8mm pins/holes molded into the halves. They had a white writing-label, four adhesive film-tabs inside, and were plainly marked along the top, “Revised by Sam Smith” and between the apertures with “62”. These were a huge improvement over the original mounts and, with them, precision mounting was possible. 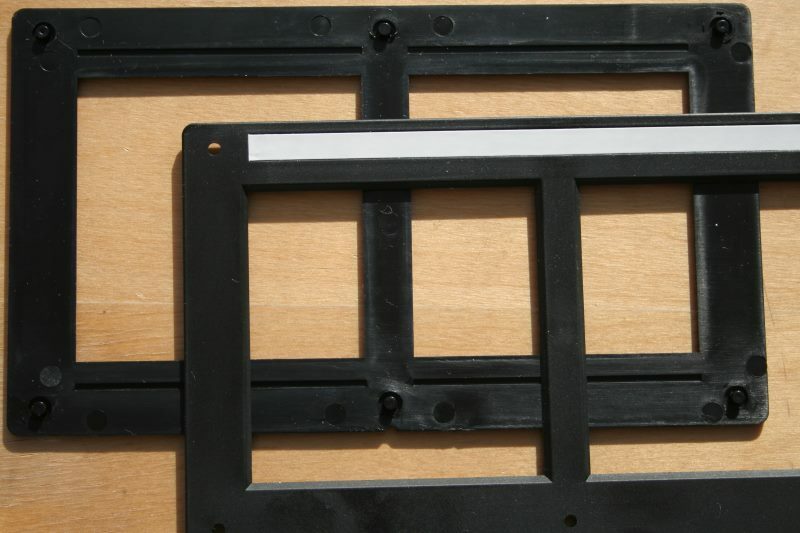 Two fundamental differences between the 80x132mm cardboard mounts and the 80x140mm plastic mounts are the vertical placement of the apertures, and the symmetry of the “front” and the “back”. 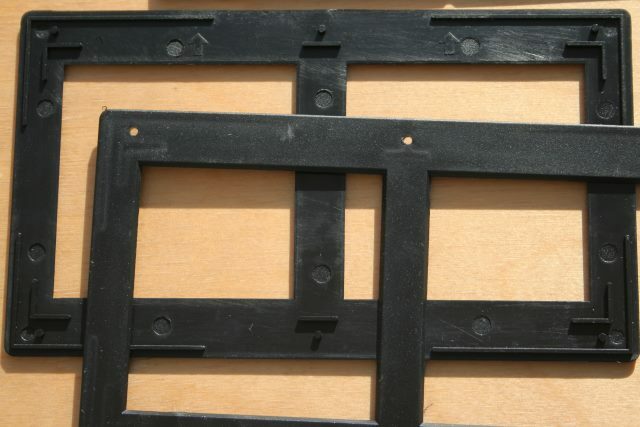 The apertures on the plastic mounts are vertically centered and (in theory) the same size on the front and the back halves. The apertures on the cardboard mounts are located 11mm below the center-line and the round-corner apertures on the front-half are slightly smaller than the square-cornered openings on the back-half. In both of these characteristics I prefer those of the cardboard mounts. Late in 2008, I had the opportunity to see some images mounting in 80x140mm mounts I didn’t recognize. They were similar to, but a bit different from, the 3D World “Sam Smith” mounts. A brief note to George Themelis confirmed these were likely a newer model mount from 3D World and he soon had a sample in my hands. These mounts are still 2.8mm thick but have 53mm apertures spaced at 62mm. There are still six pins/holes molded into the halves, but the pins are 2.4mm in diameter and look more substantial. The mounts carry no markings but do have a noticeable notch in the middle of one long edge, four adhesive film-tabs inside, and a white writing-label. The 53mm apertures provide a very large image in the viewer, but offer very little wiggle room when mounting. These mounts also have 54mm openings on the half of the mount with the adhesive tabs. It is not clear if this is by design or by oversight, but it does mean that images in these mounts should be mounted such that the pin-half of the mount (with the 53mm apertures) is the front. Both of these models are 3.3mm thick, and are held together with six 2mm pins in addition to a trough & groove arrangement. The square apertures are spaced at 65mm and the mounts are marked “HOLGA 3DSM-120”. The panoramic apertures are spaced at 66mm and the mounts are marked “HOLGA 3DSM-135”. While similar in external appearance to the new 3D World mounts, they are fundamentally flawed. Even if the moldings were accurately made (which they are not), Holga has recreated the design defects of the first-edition 3D World mounts. The spacing of the apertures means that anything mounted in them will be forced in front of the stereo window. It will be impossible to do precision mounting in the the Holga mounts and they are not recommended. Don’t use the Holga mounts. Dont use the first generation 3D World mounts. Choose a mount which will fit the viewer used by your intended audience. If you use a Sputnik or other camera which leaks light or otherwise requires heavy masking, use a mount which has 50mm apertures. Check your mounts’ apertures. If they are not exactly the same size in both halves, put the smaller opening in front.